How does restaurant music choice affect customer behaviour? Why do restaurants play the music they play? There are certain things restaurants consider when deciding on what their patrons eat to. Just as when deciding what colors to paint your restaurant, or how to design your menu, the first rule is that the music chosen for your establishment must project the kind of image that you would like to project in order to maintain a consistent brand image and consistent experience for the customer. As the guardian points out, “sound is the final frontier in food presentation. Restaurants agonise over menus, crockery, furniture and lighting, yet often any old CD will be stuck on for background music with nary a thought”, but things are changing! Music is an area of research that has been getting a lot of attention lately, as restaurateurs start taking the music they play in their establishments increasingly seriously. Generally speaking, louder music draws people in by creating an exciting and vibrant environment…or at least making it appear so. Studies have shown that the louder and faster that music is, the faster we eat and drink. This usually isn’t to escape the music, as some might think, but rather that the music gives us energy and we feel the stimulation to consume. 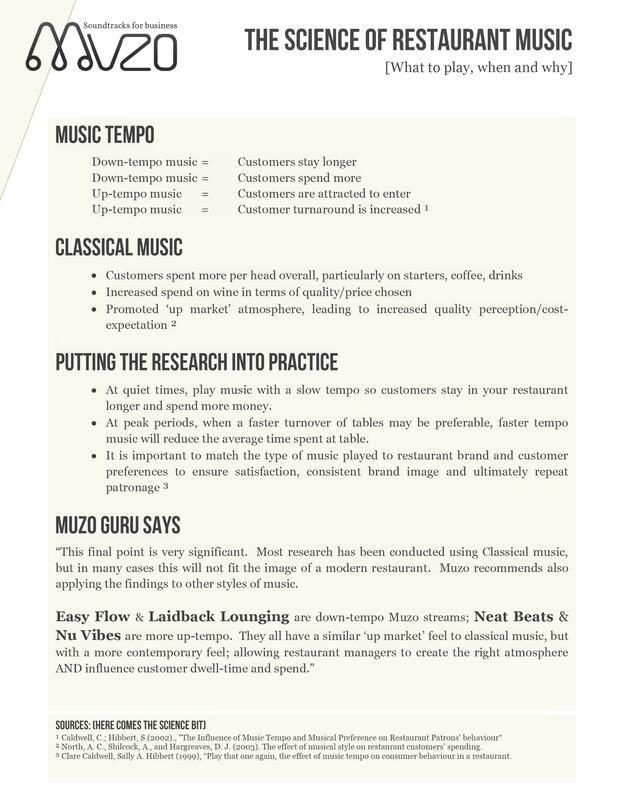 According to muzo, up tempo music means that customers are tempted to enter and the restaurant experiences a higher customer turnover. During busier periods, the idea is to turn up the music tempo — pump up the energy and move customers through your establishment quickly. But it gets more complex than that. According to some recent research conducted by Cornell University’s Brian Wansink, softer music can lead to not only reduced consumption, but actually increase the enjoyment of the food as well. Down tempo music means that customers stay for a significantly longer period of time, while increasing their satisfaction. This means that slower periods in your restaurant should call for slower music, so that customers stay longer and, of course, spend more. As a side note, classical music in particular has been shown to greatly affect perception of a restaurant as well as customer behaviour. Restaurants playing classical music generally experience an increased quality perception, overall increase in amount purchased per head and specifically an increase in the price and quality of wine sold. Beyond the kind of music being played, it’s loudness is another important question. It’s been shown that music loudness is the number two complaint of patrons (behind only customer service). A few studies, however, have indicated that exposure to music can make alcohol taste sweeter, which could lead to higher alcohol sales. Playing with music volume and finding that sweet spot for your establishment, could play a part in your restaurant’s sales. Take note: a restaurant without any soft carpeting or other materials that absorb sound, could feel louder than it is. Tile flooring, brick walls and concrete tabletops all contribute to echo, making music and conversation appear louder than it is. The most important thing to remember is that the music and ambiance you create plays a great role in how long customers will stay, how much they will spend, and what perception of your restaurant they will go home with. Selecting the type of music, when it’s played and how loudly will all play an extremely large role in the kind of restaurant experience you create for your customers.